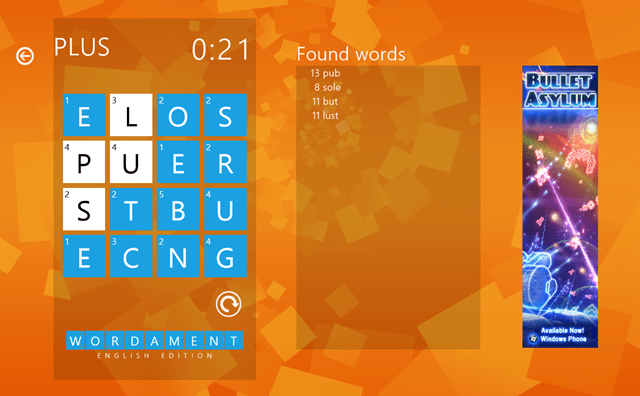 Wordament is a Windows 8 Word Game app for enriching your brain with more and more words. This is a live game by Windows 8 which can be played by a single person but, you can share your score on the leader board and also with your friends all over the world. All you need is to have your Xbox Live account and there is nothing to stop you then. This is a very simple and fun game for those who can play with words. For those, who have a great word power and a fantastic vocabulary, this game is a piece of cake. You have to stay connected to Xbox Live as long as you are playing this Windows 8 word game. And once you play it, you actually love it. Well, this is how this Windows 8 word game app looks like. You’ve got a timer at the top and you just have to swipe the letters to make a legitimate word. You can make as many words as you can. Just swipe upwards, downwards, diagonally, forward or backwards or you can swipe in continuous in any direction to produce a word. Also, check out more Windows 8 app. So, here you can see the word ‘PLUS’ which is made by a continuous move of mouse on the letters. And, the word will get added to your Found Words list. 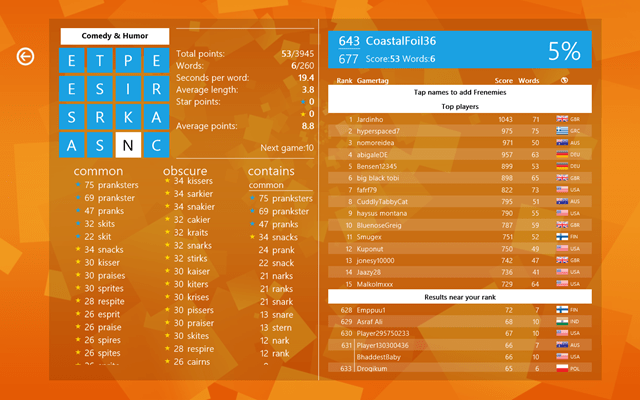 This app for Windows 8 for playing word game is very easy to play and anticipate. This will be the end of your game. And this is the place where you can check your total score and can also check your position on the leader board. You can also check the number of words you could have made by clicking on any letter from the board. 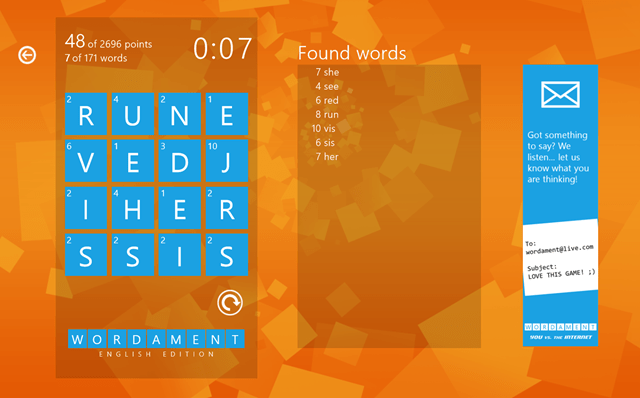 Just install this Windows 8 Word Game available under the ‘Games’ category for Windows 8 store. Have fun with it!